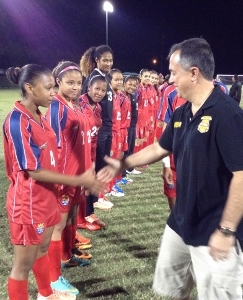 (CIFA): A fatigued Cayman Islands National Under 20 Girls team battled bravely in their second warm up match of their overseas training camp but lost to West Pines Football Club 3 nil. Despite suffering through twice daily training sessions administered by Head Coach Joe Supe and his staff, the Cayman ladies held off the home team for the entire regular period. West Pines Football Club broke the deadlock moments before the referee’s final whistle with Samantha Toribio (90th), Nicole Richards (90+2)and Jessica Roman (90+5). Coach Supe is encouraged by the team’s start to the tour in Fort Lauderdale, after drawing the first warm up on Sunday and despite defeat the team’s defense was solid. Cayman departs for Costa Rica on Wednesday for three practice matches. (CNS): Government had expected to be running a deficit of almost $38 million for the first four months of the 2013/14 financial year but instead it is more than $12 million less, which was described by Finance Minister Marco Archer as “encouraging”. Although government finances are facing a hole of some $25 million, the figure is considerably less than predicted in the budget. Archer said Thursday that government coffers always suffer in the early half of the year because it collects a significant part of its revenue in the second half. Nevertheless, government has a long way to go to reach its ambitious surplus target of over $100 million and Archer said the situation would be monitored closely. Explaining the public sector’s financial results for the four month period from 1 July to 31 October, he said that, against expectations, they were very encouraging. The public sector typically experiences a deficit during the first six months of its financial year from 1 July to 31 December and then a surplus during the last half of the year from January to the end of June. The latter half of the year is the period in which substantial revenue is received from the financial services sector and highly seasonal sources of revenue, such as Tourist Accommodation Tax. The budget expectation for the four-month period was $12.2 million more than the current amount of $25.6 million, far better than budget expectations. Government has forecast an overall year-end surplus of $100.3 million, with central government having a budgeted surplus of $95.3 million; and the remaining $5.0 million surplus is budgeted to arise from the activities of its statutory authorities and government-owned companies. (CNS): The husband of the former manager of the Pines has paid back an undisclosed sum to the not-for-profit retirement home. 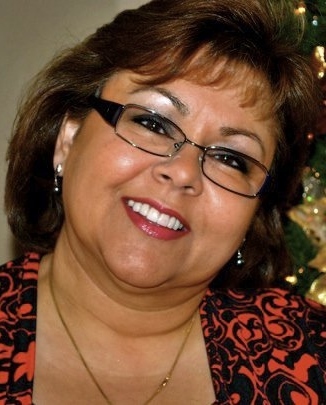 Officials said they had received a full reimbursement of the sum identified by its forensic investigation into the cash which went missing during Sue Nicholson’s tenure. Julian Reddyhough, the chairman of the home’s board, said that interest had also been paid on the funds. However, the payments, which were made by John Nicholson, were revealed to have been handed over without any admission of wrongdoing and without any assistance from Sue Nicholson, who was sacked following the discovery of the missing cash. Reddyhough said that the Pines was co-operating fully with the investigation by the RCIPS Financial Crimes Unit, which began earlier this year, and it was as a result of this enquiry that the home was not revealing the details of the alleged fraud or the figure involved. “As we do not wish to prejudice this ongoing investigation or any subsequent criminal trial we have not at this stage released details of what has occurred or of the total involved, save to say that the total sum is a material figure,” Reddyhough said in a statement released to the press Friday. The revelation that the former boss of the home was dismissed came in May this year after the alleged fraud was discovered. She then left the island under a cloud of suspicion. The police confirmed that they had received a report regarding allegations of theft some time later but were waiting on an auditor’s report. In July the investigation was stalled as the RCIPS said they were still waiting for the Pines to reveal the details of a theft and waiting for the officials at the home to make a statement. During this time there had been concerns raised in the community that the issue was being swept under the carpet. This was denied by the board, which issued a statement indicating that they were angry and dismayed at the fraud. Following the statement released by the home today, CNS asked the RCIPS for an update and they confirmed that the enquiry continues. The RCIPS also confirmed that Sue Nicholson hasnever been arrested or spoken to by the police as she remains outside the jurisdiction. Nevertheless, a spokesperson said the investigation goes on and this would not cease because the money was paid back. "That request will have to be made by the complainant to the court due to the large sum involved," the police stated, adding that at this point the RCIPS could not reveal any more information because it is a live investigation. In his statement Reddyhough said it had taken many months of hard work by the forensic accountants, KPMG, and their former senior partner, Theo Bullmore, to reach the point where they had been able to recover all of the missing money. Nevertheless, he pointed to the considerable burden placed on the volunteer board, administrative staff and on its professional advisers. “We have instituted anti-fraud training for our administrative staff and KPMG has undertaken to offer periodic spot audits,” Reddyhough explained. “We have also updated our operational procedures in line with recommendations received from KPMG. We believe that these steps will minimize as far as practicable the chances of this type of event recurring. It is regrettable that a charity is forced to take these steps and, of course, no steps can provide 100% security against a person who is sufficiently motivated or cunning,” he added, giving the only hint of the alleged crime. “Finally, we have been heartened by the continued support for The Pines demonstrated by the local community and by our benefactors,” he said, as he thanked them all. (CNS) Updated: Following the arrest of two local men yesterday in connection with a hoax bomb alert last Saturday, which led to the evacuation of the Ritz-Carlton, Cayman and the Caribbean Club on Seven Mile Beach, one man has now been charged and the other released. The RCIPS said Thursday morning that officers from the Drugs & Serious Crime Task Force had arrested the two Caymanian men, aged 48 and 53, on suspicion of “bomb hoax” and both were in police custody as officers waited on a decision from the Director of Public Prosecutions over charges. 53-year-old James Bernie Williams appeared in court Friday and the case is expected to be transmitted to the Grand Court in the New Year. The hoax had caused considerable disruption and police said that meetings were held this week to review the response to the threat. Police, fire, EMC, 911 personnel and the management of the Ritz-Carlton and the Caribbean Club have since met to review how the bomb threat was handled as both the Ritz-Carlton and the Caribbean Club initiated a full scale evacuation. “The meeting was intended to improve upon how police and other emergency staff can work with and compliment these arrangements,” an RCIPS spokesperson explained. The police said the hotel staff at both venues reacted and implemented their emergency procedures preceding the arrival of emergency services and did so efficiently and effectively. “It is clear both venues and their staff had comprehensive plans in place, trained their staff effectively and the weekend’s events demonstrated the effectiveness of their plans and staff training,” said Police Commissioner David Baines. 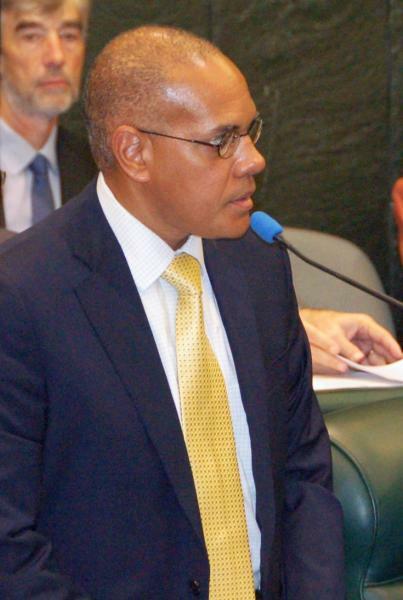 (CNS): The fuel duty cut for gas sold on Cayman Brac and duty cuts for building materials sold on all three islands is to continue throughout 2014, Finance Minister Marco Archer said Thursday. In an effort to further stimulate economic activity, the government will be extending the existing concessions until 31 December 2014. “The extension of these concessions is consistent with the government’s ongoing efforts to stimulate growth in the economy, and I encourage all developers and other stakeholders to accelerate their construction activity during this further concessionary period,” he said. The concessions apply to the import duty rate ofjust 12.5 cents per gallon for the importation of gasoline to Cayman Brac and the 100% waiver on building materials imported to both Cayman Brac and Little Cayman as well as the flat 15% import duty rate on building materials imported to Grand Cayman. The normal rate of import duty on motor gasoline is 75 cents per gallon whilst the normal import duty rate on building material ranges from 17% to 22%. Items such as furniture, accessories, electronics and appliances are specifically excluded. (CNS): Don Patrick, the owner and mechanic of Wes-Tec Jet Ski performance race team, has successfully invented and patented a Jet Ski part which is credited with assisting the performance of the racing watercraft. Patrick, who has been involved in the watercraft racing and recreational arena for over 18 years, is well known in the local community for his mechanical fixes and engine rebuilds. 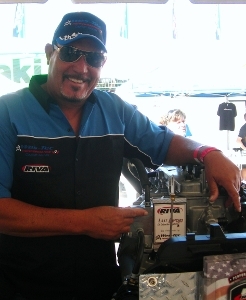 Now he has created an important machine part that is being sold all over the world by Riva Motorsports in Florida following its debut at the annual World Finals held in Lake Havasu Arizona in October. The gizmo known as the “Last Drop Oil Extraction Systems” took several months to perfect and corrects a fault on Jetskis that allowed dirty oil to mix with new. Patrick said that he has been tinkering around with Jetskis since he got his first watercraft in 1989. “I started trying things to my wave runner in the quest of making it go faster but still keeping it reliable. There were only a few things on the market for the particular one I owned so it kind of forced me to come up with my own ideas and to try different stuff," he said. A regular reader of “Splash” and “Personal Watercraft Illustrated” and their technical articles, he also learned a lot of from them. “Later I built engines and setup race crafts for many well-known top notch local riders like Jason Smith, Kenny Rankin, Shane ‘Nobe’ Edwards and Billy ‘The Kid’ Ebanks, to name a few,” Patrick added. The unique idea for the now patented part started in 2009 during the build of Yamaha’s largest motor, when it was realized that the design of the oil pan would trap a lot of oil into its bottom and no way to get it all out. This, he explained was detrimental as every time the oil was changed, fresh oil was mixing with contaminated oil which was re-circulated throughout the engine. This was not good for the reliability of the engine, especially in high performance applications, as oil is the life of any internal combustion engine and the cleaner the oil the better the performance. Patrick realized there was an opportunity to create a product to improve this. In 2011 six different product prototypes were built and tested with some 300 oil changes during the research and development of the product. When the final prototype was developed a patent search was done to see if had previously been invented but nothing even similar turned up so. Patrick quickly patented the product in his name/Team Wes-Tec’s Performance. The product was pitched to Riva Motorsports and they took it up and are now selling the product on the website as well as on the famous watercraft forum “Green Hulk”. “It’s been a long time coming but I am very blessed to make it this far and to have something of great importance and a first for the Watercraft Industry — it is a great achievement,” Patrick said, adding he was proud to represent Cayman.